Small business owners are always worried about two things: making sure their repeat customers keep coming back as well as hoping customers recommend them to their friends and family – the largest source of new customers. Our indoor digital billboards show your message and brand thousands of times throughout your local community. This allows you to stay top of mind and relevant to encourage word of mouth referrals. N-Compass TV Authorized Dealers setup indoor digital billboards in their local communities, in locations such as gyms, bars and anywhere else that attracts local consumers. Other local businesses buy time on these screens. By sharing and connecting to each other’s screens, businesses can talk to their customers when they want, where they want, whenever they want. This business builds passive income. Do you want to undertake all the expenses and responsibilities that opening a brick and mortar business entails every day? Or would you rather sell 10 spots to 10 businesses and collect checks every month? Our model enables you to set your own schedule and grow at your own pace. Once you start you’ll just repeat each step. Gain more hosts, sell more advertisers. The more you get out and talk to people, the easier repeating these steps become! AT N-COMPASS TV, WE MAKE IT EASY. With our training and support, you can bring an indoor digital billboard network to your community. We walk you through all of the steps to help you get your new business up and running. Our team is trained to assist you whether you’re a first time business owner or a seasoned entrepreneur. We demystify the process and make it easy. Our expert design team works with you to create the logo you want for your business. We then create everything you will need – your business cards, website, marketing materials, contracts, and your own branding ads for your digital signage. We make your business look the best it can! 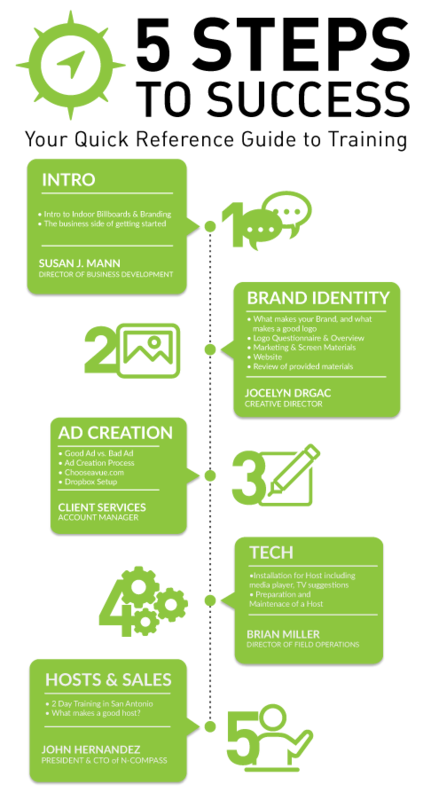 Our client services team walks you through the entire process of creating the perfect ad for your future clients. They are also available throughout the life of your business to help you through any issues or questions you may have. Our Director of Field Operations will guide you through all of the technical aspects of your new business: installation, equipment, and connectivity. We make it easy for everyone understand and implement, even if technology is not your forte. The crown jewel of our training program is our Training Center in San Antonio. You will receive hands on experience and time in the field learning the best practices of a successful dealership. 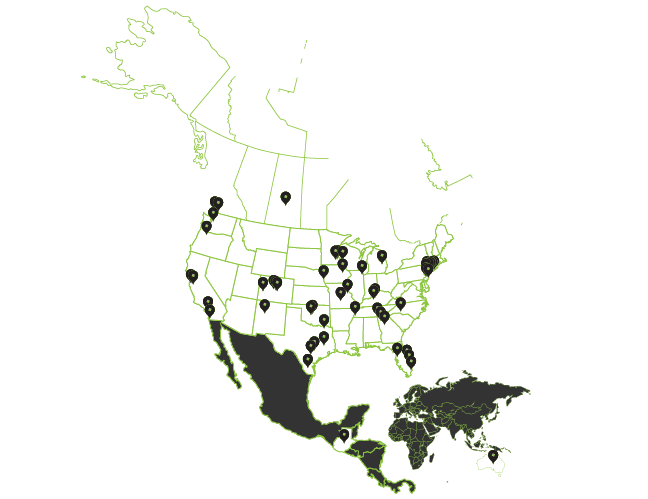 Today more than 80 dealers are growing their networks in communities just like yours. We’re servicing thousands of customers with more than 600 locations around the world.